I have made Christmas Cookies for me, Shortbread and Coconut Jam Squares, I have made Christmas Cookies for my daughters, Chocolate Sugar Cookies and Whipped Shortbread (they are in the freezer waiting for you). 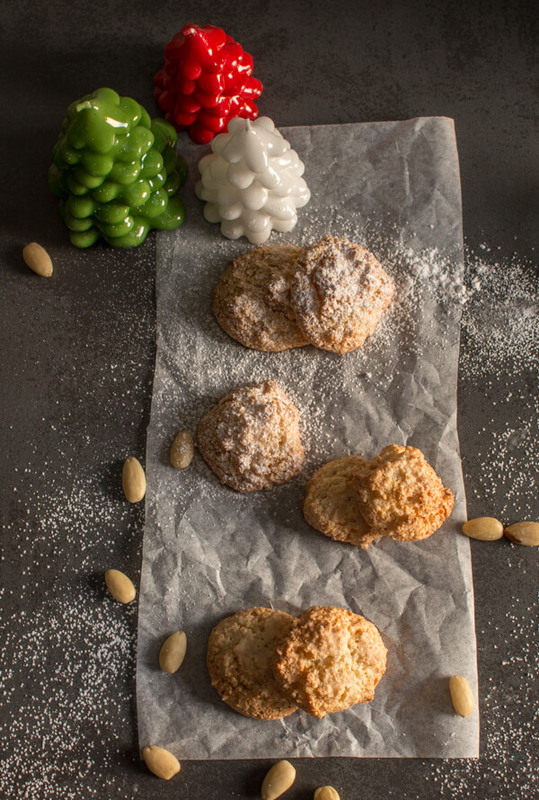 And now I have made Cookies for the Italian, Amaretti Cookies or also known as Italian Almond Cookies. My husband is an absolute Nut lover. He has even planted a few nut trees, Hazelnut and Walnut to be exact. He adores Christmas just so he can sink his teeth into some Torrone. 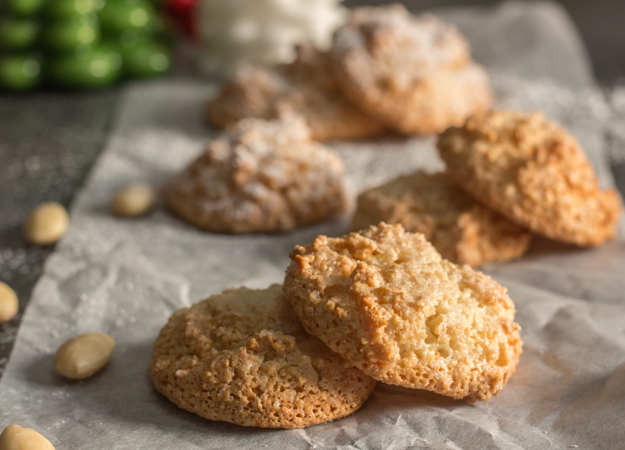 Amaretti Cookies are basically found in all of Italy, meaning they are found in every Region. Although every region makes them a little different. Some let the dough refrigerate for 24 hours and some add an Almond Liqueur. Some use icing sugar and some granulated sugar. I did neither, I made a simple recipe that caught my eye and that I made a few times to get it just the way the Italian liked it. And by the way I used granulated sugar. 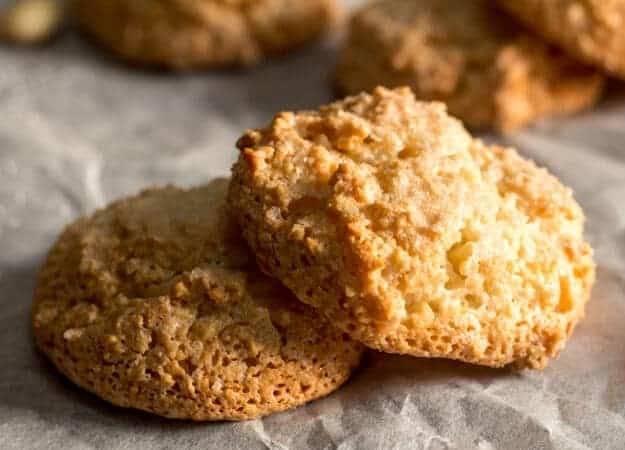 These Amaretti are a crispy on the outside and chewy on the inside type of cookie. It is so quick and easy that if you have unexpected guests arrive this holiday Season you could slip into the kitchen, whip them up and no body would notice you gone. Ok maybe a bit of an exaggeration! But these Amaretti do come together very quickly. Just add the whole almonds, some people roast them first, I didn’t but my almonds were really fresh. Then grind them fine with the sugar. I didn’t grind them too fine, my husband likes a bite to them. Add the egg whites and this is where it makes all the difference, use medium eggs not large or small. You want a nice compact mixture, and don’t forget a half teaspoon of almond flavouring. The first time I used large eggs and the mixture was a little runny, it worked, but the mixture with the medium egg whites was better. 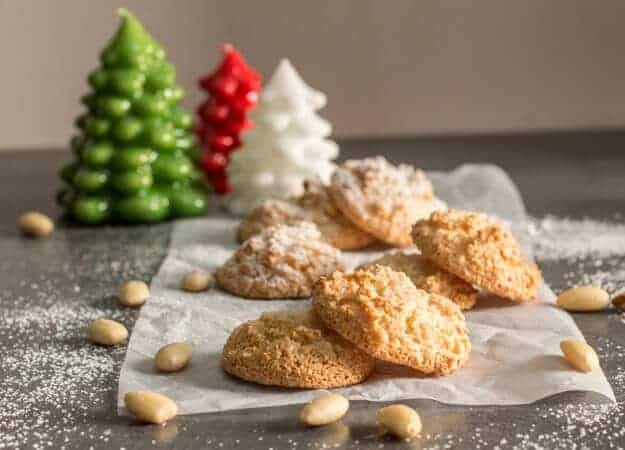 Sprinkle with a little sugar before baking and there you have a delicious Italian Christmas Cookie, gluten and dairy free too! Enjoy! 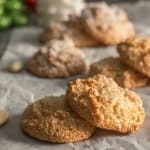 Amaretti Cookies,a sweet Italian Almond Cookie crispy on the outside and chewy on the inside cookie recipe.Fast & easy,gluten and dairy free. Pre-heat oven to 340°F (170° celsius). Line cookie sheets with parchment paper. In a food processor add almonds and sugar and pulse for 20 seconds until mixture is very crumbly. Then add egg whites and almond flavouring again pulse for 30 seconds until mixture comes together. Place a teaspoon full of mixture on cookie sheets, leave space between each addition, sprinkle with granulated sugar and bake for approximately 15 -20 minutes until golden. Let cool completely, sprinkle with icing sugar if desired. Enjoy! **Place almonds in a single layer on a baking sheet and bake for 10-15 minutes at 350°F (180°C). (mix a couple of times while in the oven) Let cool 20 minutes before grinding. ?? I would like to use ground almond meal rather than making my own-what is the amount needed? Hi Ruth you will need approximately 3/4 cup of almond meal. Start with that and if it’s too wet add an extra tablespoon.But the dough should be on the wetter side. Hope that helps. Will this work with liquid egg whites from a carton or do they have to be pasteurized egg whites? Thanks! Hi Steph, I think the liquid egg whites would work. Let me know how it goes. Hi Linda, I have never frozen them because they get eaten before I can, but yes apparently they can be frozen, just be sure to defrost them thoroughly before serving. Have a great weekend. Could I use almond meal or almond flour instead of grinding the almonds up? Would I use the same weight you think? Hi Carol, I am going to say no, because I did that once with cookies and I had to throw them away. You also need the moisture from the almonds the flour or meal would make it much too dry. Hope that helps. 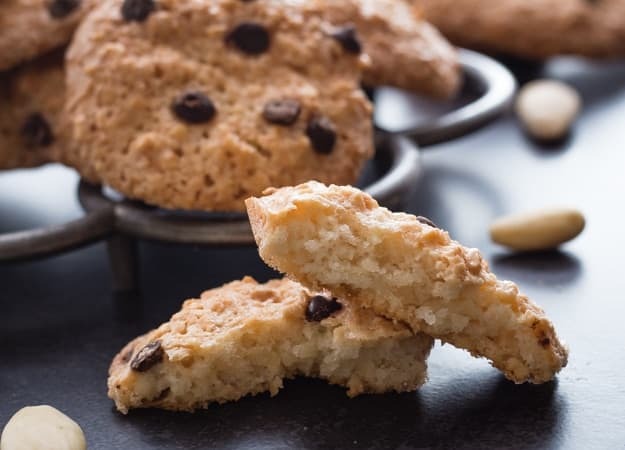 Hi I always use almond flour – I think how fresh it is makes the difference. I get men from the local Italian bakery (well actually there is on one). I tried making it with ground almonds – the texture was less marzipanish – but delicious anyway. I add finely grated orange peel to the mixture – adds a bit of bite. This is my favourite go to recipe and my family adore it. Hi Susan, so glad you enjoyed it and great idea with the grated orange peel. Have a great week. Thanks Lauren, Have a wonderful Christmas. I need to try these! Beautiful! Hi Ally, thanks so much. Hi Lane & Holly, thank you, they were enjoyed. Hi Kristen, thanks let me know how you like them. Have a wonderful Christmas.